Although most Americans were outraged by Arkansas’s Congressional Representative Tom Cotton’s violation of the Logan Act, (trending on Twitter as #47Traitors) media missed how the Arkansas Legislature pulled a Rand Paul in order to assist Cotton to higher office. Kentucky legislators changed the rules so Rand Paul can leisurely decide to run for President, or his seat in Congress. However, with a raspberry to Kentucky’s Rand Paul, Tom Cotton’s Arkansas cronies went Kentucky four times better. On Tuesday the Arkansas Legislature endorsed Senate Bill 803 to allow Tom Cotton to run for for President, or Vice-President, while at the same time, preserving his right to remain in Congress and run for re-election in the Senate or the House. Senate Bill 802 was introduced by Rep. Senator Bart Hester, with Sen. David Burnett, (D-Osceola) casting the lone vote against SB 803 in committee. “I think they need to step down if they’re going to run for higher office,” Burnett said. The Bill goes to the full Arkansas Senate next week. However, with Cotton in office, it looks as if the Republican war on women is again: 100% Gears Up! 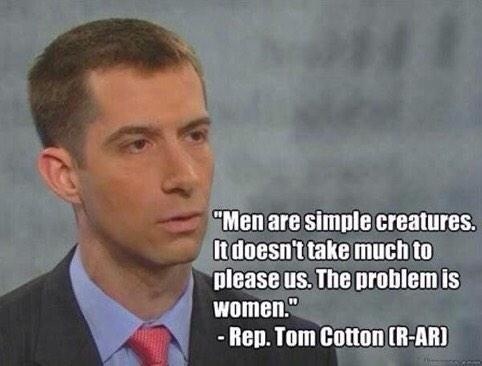 Cotton has not not once passed any legislation to protect women. Being extremely right wing (again, the Harvard education proved a waste of time and money) Cotton doesn’t even want women in combat. So you know he voted against protecting them from domestic violence. Check out Cotton’s record here. Better, if you can stand it, is Tom Cotton from his days at Harvard, which reveal, well, again, a wasted education given Cotton is on record on marriae, divorce, is straight out of the dark ages. Largely with the legislature helping these guys scramble to run for any office, it’s not looking good for women. Also, we can expect states will also jump to follow Arkansas’ lead to change the rules so knuckle draggers with their vast background of 60 days in office can continue to think they’re knocking out of the park. My other fear is idiotic Republican women. Seriously, check this recent, Indiana example. This entry was posted in Civil Rights, Government, Journalism, Law, Media, misogyny and tagged #47Traitors, misogyny, Rand Paul, Tom Cotton. Bookmark the permalink. Pursuing peace deal to lift sanctions is not only the best deal, but the smartest deal. Verification is better than trust and the treaty will provide that. Netanyahu has been off his rocker since ’96 when he said Iran was a few years from the bomb. Guess what? Still don’t have it, and by choice. I’d like the media to dig around in the cesspool created by another Christian Conservative in Arkansas – State Rep. Justin Harris – for financial connections to Tom Cotton. Harris received over $4 million in state & federal funds since 2010 through his preschool, Growing God’s Kingdom. Now that is $1 million per year, so I figure some of it had to go back into Cotton’s pockets. Harris & his wife also received public funds to adopt 3 sisters ages 6, 4 & 2, continuing to cash DHS checks after the girls were “rehomed” with friends (girls were just too much trouble). Unfortunately, one of the friends later raped one of the little girls & all hell broke loose. Gotta love these folks who use & abuse Christianity to hide padding of their pockets. A bunch of people are all over Justin Harris. Arkansas legislators are backing away from him pretty fast. This is significant. Thanks Bonnie! Unfortunately, mainstream media is missing this at worst or will be slow in covering it at best. I believe it is essential to consider law makers aspirations and motivations. What are their long term goals, who are their role models, and who are the people they share time and money with. Law makers make quality of life and life or death decisions that usually have the most profound effects on the 99% (as the 1% pretty much maintain the same lifestyle no matter what the laws in America are). It appears that US Senator Tom Cotton has no problem dehumanizing and objectifying people. Whether it is women, non-Christians, the POTUS or anyone that doesn’t agree with the Koch, Ailes, Murdoch, Adelson, et al White supremacy patriarchal system of commerce and population management. Some people join the military because they love their country and are inclined to service or in the least are drawn to a regular income and structure. However, just like in law enforcement, some are attracted to military careers because it presents an opportunity to destroy and to kill. I don’t know what motivated Tom Cotton to join the military. I do know that he and most of the GOP appear to tragically display his sociopathic trait of lacking empathy not just for the POTUS but also diverse demographics foreign and domestic. Dulles Brothers idea we must go to war with people of difference…as one connects the dots it suggests a choreographed plan to divide the 99 percent. You need to add buttons for us to be able to share with a simple click. I gotta tweet this the old fashioned way now, LOL. lol – I just took ’em off today! They kept popping up…and since they bugged me, I figured they would bug others too. Go figure! Thank you. I am still trying to figure out how mainstream media missed it. Kinda scary. MSN, do not suspect it is a miss, more like part of their agenda to not cover real news.